Alan M. Greene is a senior member of Dykema's Real Estate and Environmental Department and served on Dykema's Board of Directors from 2001 to 2007 and formerly acted as the Firm's partner in charge of professional personnel. 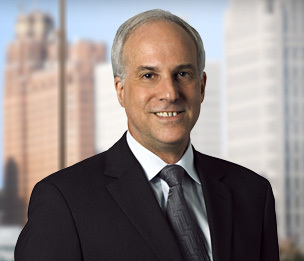 His practice focuses on real estate development and construction transactions and litigation, with particular emphasis on land use, zoning, lending, joint venture and construction disputes. Mr. Greene began his career at Dykema in 1980 as a trial attorney involved in complex commercial disputes, including construction claims, securities fraud, racketeering and land use and zoning disputes. His practice evolved to focus primarily on real estate development, construction and land use matters. Mr. Greene's experience and practice includes a unique blend of real estate and construction transactional matters and litigation regarding development projects, including work on real estate joint ventures, real estate acquisitions, loan workouts, project entitlements, zoning and land use and construction contracts. Mr. Greene regularly appears before municipal, county and state agencies regarding real estate development projects and has handled lawsuits in Federal and State courts involving office buildings, asphalt plants, industrial and commercial facilities, mining and resource recovery projects, cellular telephone towers and various residential developments. Mr. Greene has handled numerous construction disputes for owners, contractors and subcontractors in Federal and State courts and in arbitration involving hospitals, office buildings, industrial facilities, airport terminals, public school projects, condominiums and mass transit. Mr. Greene has also arbitrated numerous construction, real estate and securities fraud disputes and has served as an arbitrator for the American Arbitration Association (AAA), the National Association of Securities Dealers (NASD) and as a private arbitrator, facilitator and mediator appointed by court order. Lawson v. London Arts Group, 708 F.2d 226 (6th Cir. 1983), Fraud; Breach of Contract. Hitachi Zosen Clearing, Inc. v. Tek-Matic, Inc., 846 F.2d 27 (6th Cir. 1987). Breach of Contract, Automotive Production Machinery. In Re Allied Supermarkets, 951 F.2d 718 (6th Cir. 1991). Fraud; Breach of Contract. Lake Angelo Associates v. White Lake Township, 198 Mich. App. 65 (1993). Land Use Dispute. Renaissance Center Ventures v. Lozovoj, 884 F. Supp. 1132 (E.D. MI 1995). Racketeering and Fraud. FHC Equities, L.L.C. v. MBL Life Assurance Corp., 188 F.3d 678 (6th Cir. 1999). Real Estate Dispute. Tandy Corporation v. City of Livonia, 81 F. Supp. 2d 800 (E.D. MI 1999). Land Use Dispute. Lake Isabella Dev. Inc. v. Village of Lake Isabella, 259 Mich. App. 393 (2003). Regulatory Dispute over Sewer Treatment Facilities. "Michigan Zoning, Planning, and Land Use"